Finally there is a laser that can remove unwanted hair for those with darker skin tones. 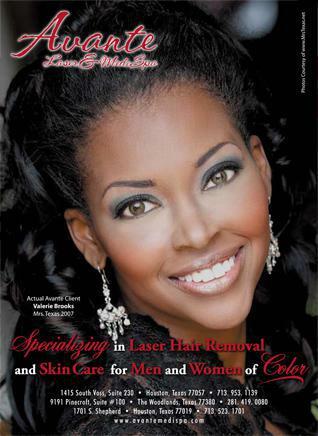 Avante Laser & MediSpa was the 1st Laser Hair Removal clinic in The Woodlands and Houston to offer FDA approved Laser Hair Removal for Black Americans and other dark skin clients. Over 15 years ago Avante implemented the most advanced laser technology available for those clients with darker skin tones, with the Nd:YAG laser. The YAG laser offers a deeper wavelength (1064 nm) which is not attracted to the skin, but bypasses the skin and goes straight to the unwanted hair. The procedure is virtually painless and the results are fantastic. For those clients with ingrown facial or body hairs, laser can be a life changing experience. So don't wait any longer. Click Here to set up your complimentary consultation and test spot and let Avante help you on your way to that soft, smooth, hairfree skin you've always dreamed of.